This is exactly what you should do when you have celery that needs to be used up. Classic recipes are classics for a reason. My version takes the classic flavours and kicks it up a notch by making it a vegan one pot wonder. 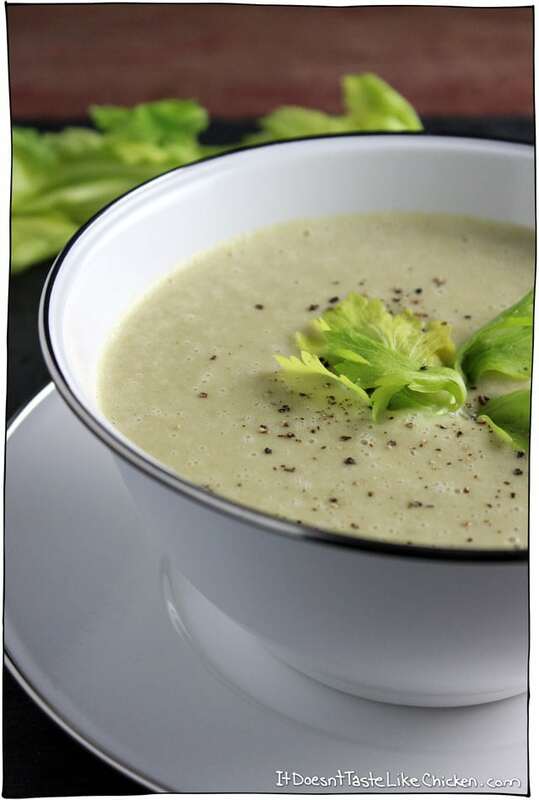 When pondering how to make a celery soup actually interesting, I knew that adding cashew cream, was a very good idea. I mean cashew cream, yum. Instead of making the cashew cream separately, I decided, hey, why not make it right in the same pot! In this recipe you simmer the cashews right along with the rest of the soup. This makes them very soft (the same result as soaking cashews). Then when you blend the soup up, the cashews blend right along with it making cream right in the soup. Insta-creamy soup! I feel so clever right now. The result is a soup that tastes insanely good. Full of delicious celery flavour, velvety, deeply flavoured, and totally scrumptious. Enjoy as an appetizer, or make it into a meal by serving with a crusty baguette. This recipe is so quick and easy. Just take your celery and onion and chop them up. Then mince the garlic. 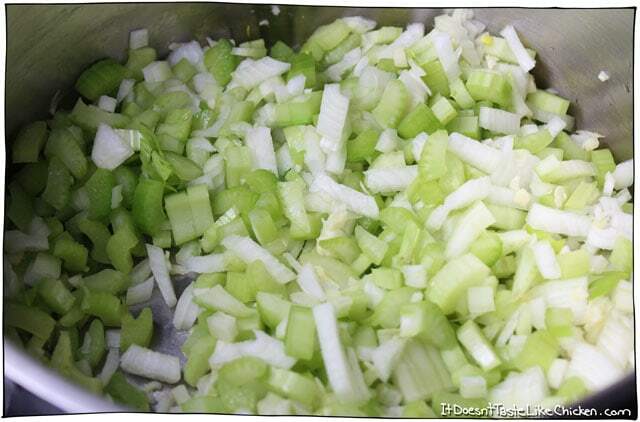 Heat olive oil in a big pot then sauté the celery, onions, and garlic for about 5 to 10 minutes until translucent. Pour in the vegetable broth and water, then slowly pour in the flour as you whisk, to help avoid lumps. Now toss in the bay leaf, thyme, and raw cashews. Yep, just toss those raw cashews straight in the pot. Now let that simmer for about 15 minutes until the cashews are very soft. Blend it all up, and enjoy your soup! 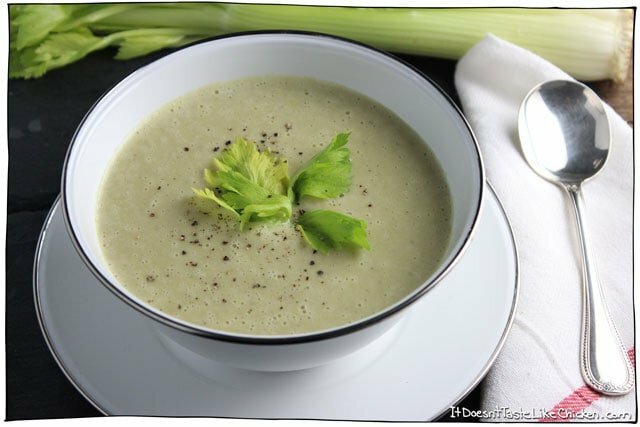 One pot Vegan Cream of Celery Soup! Simmer the cashews right along with the rest of the soup. This makes them very soft (the same result as soaking cashews). Then when you blend the soup up, the cashews blend right along with it making cream right in the soup. Insta-creamy soup! Heat the olive oil in a large pot over medium-high heat. Add the celery, onion, and garlic and sauté for about 5 minutes until the celery and onion begin to soften and look translucent. Add in the vegetable broth and water then sprinkle in the flour while whisking to avoid any lumps. Add in the raw cashews, bay leaf, and thyme. Bring to a simmer and cook for about 15 minutes until the cashews are very soft. Remove the bay leaf, then blend in small batches, being careful not to fill your blender too high so it doesn't erupt. If you don't have a high powered blender such as a Blendtec, make sure to blend very well so that the cashews are completely blended. Return to the pot to heat or serve directly from the blender. Season with salt and pepper if desired and garnish with some celery leaves. Featured Ingredient: Celery. 20 ingredients, 9 Days to go! (uh oh). This was so good! Like other commenters, I made a few small tweaks. Instead of cashews, I used a can of cannellini beans, And skipped the oil entirely. I cannot wait to try this with other vegetables. I feel like asparagus ends would lend themselves well to this recipe in place of the celery. 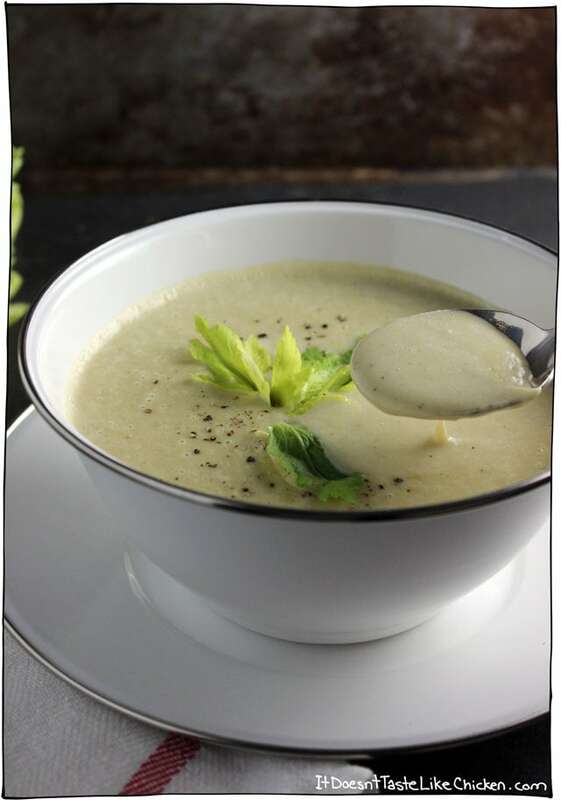 Celery soup doesn’t get any simpler or any better than this! Thank you for this perfect recipe. We love it! Hey! I’ve made this a bunch of times, sometimes subbing butternut squash for the celery, and I love it. I add some soy cream to make it even creamier. Thank you so much for the wonderful recipe! Love this soup. We made a change and used a potato rather than the flour. Works great and wheat free then. 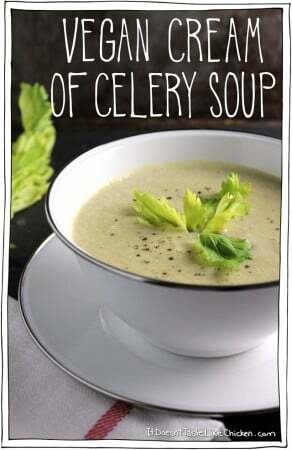 I really need a vegan cream of celery soup to replace in a recipe calling for the canned stuff! Obviously, the canned stuff is more concentrated – I’m wondering how much of the broth/water to leave out of this recipe to come up with a condensed version that is similar to the cans? I’m not sure as I haven’t tried it myself, I would skip the water and add vegetable broth as needed. Enjoy! This recipe is so good ! It was the first time I made and taste cream of celery and I love it ! I will make this recipe again because it’s such a good way to use old celery and not waste it. Thanks for the recipe. I’ve just finished a bowl and I’m feeling very satisfied. I also threw in a couple of carrots, zucchini; omitted flour. Oh, and served it with a couple of spoons of n. yeast. Yum. Hi from Down Under. I am not a vegan but I absolutely loved this recipe. Also provision for gluten free….Good on you. So happy you enjoyed it, Val! I first found your recipes on Pinterest. Then I followed your blog and bought your cookbook. I love everything I’ve made so far! I just made this soup. My non-vegan fam loved it! I used pumpkin seeds instead of cashews, as we have nut allergies in our house. It turned out great! The soup turned out very good, I’ll never let celery go bad again. Next time I’ll use a lighter broth, my veggie broth was dark and strong flavored. I mixed the water and flour in a jar and added it after the soup was bubbling otherwise followed the recipe. I was also very pleased that my inexpensive Sunbeam blender made it all creamy and smooth. 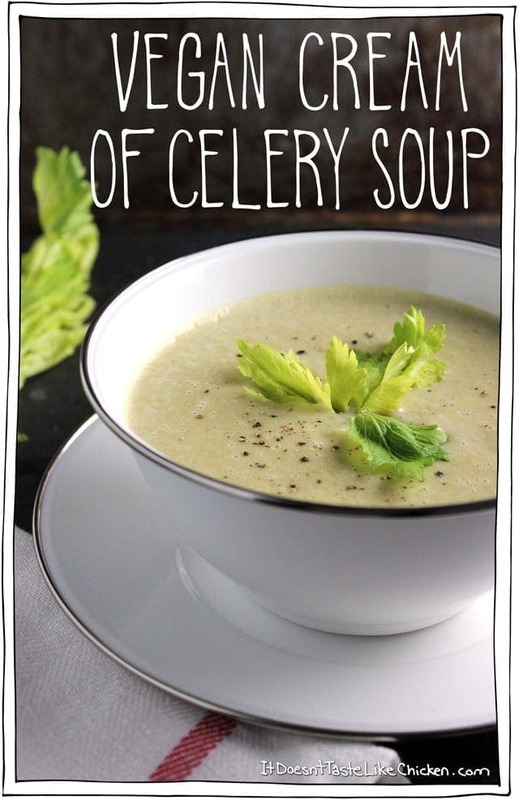 Now I need to find more recipes to use up some of this celery soup! I put half in the freezer. Thank you! This looks delicious! I’m just wondering if soaked blanched almonds would work in place of the cashews as I can’t eat cashews. Yes, they should work wonderfully. Enjoy! Delicious! I made it with a small yellow potato instead of flour and a shallot in lieu of garlic. Even my picky meat-eater husband liked it. Can you freeze it? I’m single so it won’t all be eaten at once. Yes, it should freeze well. Enjoy! Oh why did I see this now? I have HOURS til home time and all i can think about is the soup! I’ve used a recipe like this but mushrooms instead of celery and it was amazing. The cashew trick is the best vegan trick ever I think! Made it last night. Was an absolute smash hit with everyone – including friends who popped over. Definitely going to be a high rotation recipe. Thanks! I just made this soup and it is amazing! It is one of the best soups that I have ever made! I sauteed the vegetables in one cup of the vegetable broth instead of the oil. I substituted a large potato for the flour. 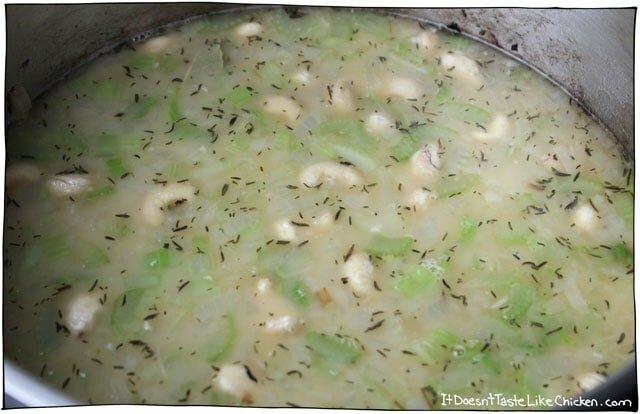 I added a few stocks of chopped celery after blending. I am excited to try this recipe! I have a bunch of organic celery that I want to use. I also have some carrots I would like to add. Can you recommend how/when to add them? I’m pretty new to cooking in general, so even though adding veggies is basic, I’m not sure if I need to saute the carrots first or if I can put raw slices into the soup as I cook it… Any advice is appreciated. Thank you!! I actually wouldn’t recommend adding carrots as the green celery and orange carrots will cause the soup to be a really unappetizing colour! I always recommend for new cooks to follow the recipe as written for best results. Hope that helps! Thanks! I didn’t think of that haha. I made the recipe as is and it came out very nicely! I will use my carrots for something else ;-). Oh my! That was delicious! You are a GENIUS – the cashew thing is amazing! My variations were to add the greens of the celery too (I love greens and it kills me to throw them away) and the potato instead of flour as mentioned in the comments above. Are the cashews essential? We have a serious nut allergy in our house and being new to vegan cooking I’m not sure what seeds can be substituted for cashews in recipes. The cashews are what make the cream part of the soup. You could skip them and instead stir in some coconut milk and it should turn out delicious! Enjoy! I haven’t tried this recipe yet (though it’s very likely to be made tonight! ), but in the past I’ve been able to substitute raw sunflower seeds for cashews or other nuts. It doesn’t work well for us to replace the cashews in Sam’s amazing gooey mozzarella recipe but it’s worked well for everything else! I’ll let you know how it goes with sunflower seeds later tonight hopefully! This soup is divine. New to vegan cooking, I do usually feel quite daunted but this was just so easy and it tastes amazing. Like some previous posters, I added a bit of potato and used a little millet flour to thicken. Lovely. Thanks this will become a culinary staple in our house. Yay! 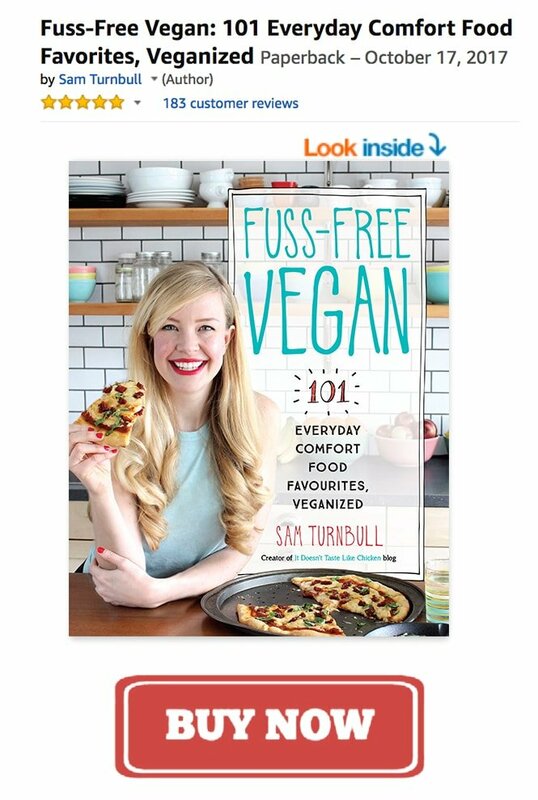 So happy you enjoyed it so much, Susan 🙂 Welcome to cooking vegan! how much potato (and what kind) to sub out for flour? would be interested in doing that. thanks! Hi Beth, I think I used about two large Yellow/White potatoes. I didn’t write it down! Damn! Sorry about that. Delicious! Creamy! Dairy-free goodness! Made this for dinner last night, and it was super yummy! Will definitely make this again. Thank you! Just made this soup for dinner tonight – it turned out great! We’re gluten free here, and I didn’t feel like using gf flour, so I threw in a bit of cooked quinoa after all the other ingredients were blended. I’ll definitely make this soup again – thanks for the recipe! I just made this and it’s very nice indeed! The only thing I think I will change next time is to add the flour when frying the veg as you need to cook it out a bit. That said it is still very nice and thank you for sharing. Because I try to avoid using flour, I instead chopped up and added six small new potatoes and it awesome. Cheers! What an amazingly easy, tasty and nutritious soup ! Brilliant recipie and now my favourite soup!! Awww thanks Pritesh! So very happy you found your new favourite soup! This looks delish! I have a fairly large celery harvest (ooooops) and need to make batches of something. Can this soup be frozen? If so, I can probably make at least 6 recipes of this. Let me know what you think. So, I went ahead and made a triple batch. This soup is absolutely amazing and so simple to make! It is my new favorite soup. It was very flavorful and the balance of savory to salt is perfect.. I used my own homemade veg broth which is really intense and probably added to the overall finished taste of this. Thank you! Well that was an incredibly easy and tasty recipe! Thanks Sam. You are becoming one of my favourite cookbooks!! 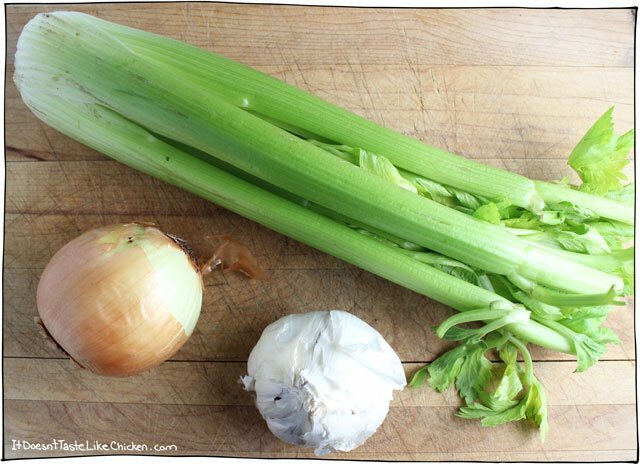 🙂 I actually used the entire bunch of celery – it was a small bunch and when I cut the six stalks, I wondered what I’d do with the rest of the celery – so I just cut it up and added it too. Also, I made this early in the day; when cooking was done, I let it sit for a couple hours so the cashews would soften further… so I could use my hand-blender and keep it all in one pot. Super simple. Hubby and 23 month old daughter loved it. Oh, and since I’m whisking-challenged… I just added the water and flour into a jar and shook it until mixed well, then poured into the pot. I like! This has left me speechless; so simple, (sounds) yummy indeed. Haha, sounds like a pretty good thing to say to me!! That looks delicious, and I’ll definitely try it out!! Isn’t she? I thought it was a terrible idea, but man did it turn out great! Such a handy recipe for me as I always have celery getting old in the fridge.